Sami Abu Zuhri is reported to be a spokesperson for the Palestinian terror organization Hamas. Zuhri regularly makes anti-Semitic, anti-Israel, and pro-violence statements. In November 2014, Zuhri declared that “[all Israeli officials are] legitimate targets for the resistance.”“Hamas Says Israeli Leaders Are ‘Legitimate Targets’,” Times of Israel, November 21, 2014, http://www.timesofisrael.com/hamas-says-israeli-leaders-are-legitimate-targets/. He is believed to operate out of the Gaza Strip. In March 2015, 26 Americans present at Israel’s Ben Gurion Airport at the time when it was targeted by Hamas missiles filed a lawsuit against the terror group. The charges of war crimes were filed against Zuhri, Hamas chief Khaled Meshaal, and other Hamas officials.Avi Lewis, “26 Americans to sue Hamas for rocket fire at Ben Gurion Airport,” Times of Israel, March 31, 2015, http://www.timesofisrael.com/26-americans-to-sue-hamas-for-airport-rocket-fire-last-summer/. Zuhri received wide media attention in 2006 when Palestinian authorities caught him attempting to smuggle more than $800,000 in cash through the Rafah border crossing from Egypt. Zuhri claimed that he was returning from Qatar with funds that had been donated to Hamas, while the Palestinian Authority accused Zuhri of smuggling money embezzled for personal use.“Hamas Caught Smuggling Cash,” Los Angeles Times, May 20, 2006, http://articles.chicagotribune.com/2006-05-20/news/0605200133_1_palestinian-executive-branch-direct-international-aid-hamas. 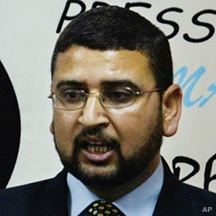 Zuhri was implicated in separate incidents of alleged sexual harassment of female journalists in the Gaza Strip in 2007 and 2014, respectively.Lazar Berman, “Hamas spokesman said to have harassed female foreign reporter,” Times of Israel, December 7, 2014, http://www.timesofisrael.com/hamas-spokesman-said-to-have-harassed-female-foreign-reporter/. Sami Abu Zuhri is reported to be a spokesperson for the Palestinian terror organization Hamas. “Hamas congratulates the three heroic operations this evening, in Tel Aviv, Jerusalem, and Jaffa, and considers this proof of the failure for all these theories to abort the Intifada (uprising), which will continue until the realization of its goals…Hamas celebrates the martyrs that have ascended through these operations, and confirms that their pure blood will, God willing, be the fuel for escalating the Intifada.”Jack Moore, “Hamas Hails Surge of Israel Attacks That Left U.S. Tourist Dead as ‘Heroic,’” Newsweek, March 9, 2016, http://www.newsweek.com/hamas-lauds-surge-israel-attacks-killed-us-tourist-heroic-435009. “All the Israeli parties are alike to us. They may disagree on many things but what unite them is their constant denial of the rights of the Palestinians and their will to continue the aggression against our people.” “Exit polls show Israel rivals in dead heat,” Al Jazeera, March 18, 2015, http://www.aljazeera.com/news/2015/03/israel-likud-zionist-union-neck-neck-150317200757434.html. In reference to the EU’s appeal against the ruling that Hamas should be removed from the terror list: “[The EU appeal] reflects the European bias to the Israeli occupation and it provides the occupation with a legitimacy to kill Palestinian civilians.”“EU to Appeal Against Ruling that Hamas Should Be Off Terror List,” Irish Times, January 19, 2015, http://www.irishtimes.com/news/world/europe/eu-to-appeal-against-ruling-that-hamas-should-be-off-terror-list-1.2071714. “[Israeli officials are] legitimate targets for the resistance.” “Hamas Says Israeli Leaders Are ‘Legitimate Targets’,” Times of Israel, November 21, 2014, http://www.timesofisrael.com/hamas-says-israeli-leaders-are-legitimate-targets/. In reference to the November 18, 2014 terror attack at the Har Nof synagogue in Jerusalem in which four Jews and one Druze policeman were killed: “The operation in Jerusalem is a response to the murder of the martyr Yusuf Ramouni and to the series of crimes by the occupier at Al-Aqsa and Hamas calls to continue these operations. Hamas calls for more operations like it.” Lazar Berman, “Hamas spokesman said to have harassed female foreign reporter,” Times of Israel, December 7, 2014, http://www.timesofisrael.com/hamas-spokesman-said-to-have-harassed-female-foreign-reporter/. In reference to the summer 2014 kidnapping of three Israeli teenagers: “Hamas praises the role martyrs Abu Aysha and Kawasme played in chasing down Israeli settlers and we stress that their assassination will not weaken the resistance.” Ali Sawafta, “Israel says its troops kill Hamas men accused of slaying teens,” Reuters, September 23, 2014, http://www.reuters.com/article/2014/09/23/us-palestinians-israel-idUSKCN0HI09H20140923. “We did not start this war. It was imposed on us. We will defend ourselves as long as the Israeli occupation chooses to fight us.” Amelia Smith, “Hamas spokesperson Sami Abu Zuhri on Israel's targeted assassinations, lifting the siege on Gaza and Egypt's role in the crisis,” Middle East Monitor, August 11, 201, https://www.middleeastmonitor.com/resources/interviews/13395-hamas-spokesperson-sami-abu-zuhri-on-israels-targeted-assassinations-lifting-the-siege-on-gaza-and-egypts-role-in-the-crisis. “We are ready for all options, including peaceful ones through mediators, whether they are Egyptians or others. We are also ready for the resistance choice, which is based on exhausting the occupation and putting it under pressure until it accepts our demands.” Amelia Smith, “Hamas spokesperson Sami Abu Zuhri on Israel's targeted assassinations, lifting the siege on Gaza and Egypt's role in the crisis,” Middle East Monitor, August 11, 201, https://www.middleeastmonitor.com/resources/interviews/13395-hamas-spokesperson-sami-abu-zuhri-on-israels-targeted-assassinations-lifting-the-siege-on-gaza-and-egypts-role-in-the-crisis. In reference to how he “navigates” the Gaza Strip in times of war: “I do my best to move naturally and stay among the ordinary people. It is natural to sacrifice ourselves the same way our people do, or even more than them. We have to be on the frontline and we will stay this way; I myself will continue to do this. I will remain similar to my brothers whatever the costs are.” Amelia Smith, “Hamas spokesperson Sami Abu Zuhri on Israel's targeted assassinations, lifting the siege on Gaza and Egypt's role in the crisis,” Middle East Monitor, August 11, 2014, https://www.middleeastmonitor.com/resources/interviews/13395-hamas-spokesperson-sami-abu-zuhri-on-israels-targeted-assassinations-lifting-the-siege-on-gaza-and-egypts-role-in-the-crisis. “The Palestinian delegation is united on all the demands of the Palestinian fighters, which are the demands of the Palestinian people.” Amelia Smith, “Hamas spokesperson Sami Abu Zuhri on Israel's targeted assassinations, lifting the siege on Gaza and Egypt's role in the crisis,” Middle East Monitor, August 11, 201, https://www.middleeastmonitor.com/resources/interviews/13395-hamas-spokesperson-sami-abu-zuhri-on-israels-targeted-assassinations-lifting-the-siege-on-gaza-and-egypts-role-in-the-crisis. “There are also military goals related to the destruction of Israeli deterrence and power and showing that the power of this occupation is no more than a big lie.” Amelia Smith, “Hamas spokesperson Sami Abu Zuhri on Israel's targeted assassinations, lifting the siege on Gaza and Egypt's role in the crisis,” Middle East Monitor, August 11, 201, https://www.middleeastmonitor.com/resources/interviews/13395-hamas-spokesperson-sami-abu-zuhri-on-israels-targeted-assassinations-lifting-the-siege-on-gaza-and-egypts-role-in-the-crisis. “The fact that people are willing to sacrifice themselves against Israeli warplanes in order to protect their homes, I believe this strategy is proving itself.”Oren Dorell, “Analysis: Human Rights or Human Shields in Gaza War?,” USA Today, July 24, 2014, http://www.usatoday.com/story/news/world/2014/07/24/israel-gaza-human-rights-human-shields/13112057/. In reference to the U.N.’s suggestion to include what Zuhri calls the “so-called Holocaust” in Gaza’s school curriculum: “We think it's more important to teach Palestinians the crimes of the Israeli occupation.”“Hamas leader denies Nazi genocide of Jews,” USA Today, August 31, 2009, http://usatoday30.usatoday.com/news/world/2009-08-31-hamas-holocaust_N.htm. In reference to the illegal smuggling of over $800,000 into the Gaza Strip: “I was bringing a sum of money which was donated by our people abroad for the Palestinian people. If bringing support for my people is a crime then I am very proud of this crime.” “President orders Hamas cash probe,” BBC News, May 19, 2006, http://news.bbc.co.uk/2/hi/middle_east/4996990.stm.